With contact profiles, contact information is visible in a sidebar menu in your email client. As you write emails to contacts, you'll see additional information about them that's stored in your HubSpot account to help make your email personalized and contextual without having to leave your inbox. Compose a new email or open an existing email in Outlook. If composing a new email, add a recipient. In the pane on the right, scroll down to the Contact profile section and click View contact. 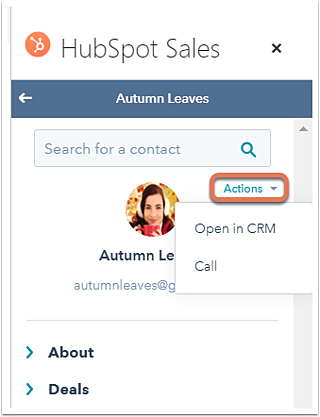 If the contact doesn't exist in your HubSpot account, click Add to CRM instead. Your email recipient will be added to HubSpot, and the contact profile for the newly-added contact will populate in the pane. Compose a new email in Outlook and add a recipient. 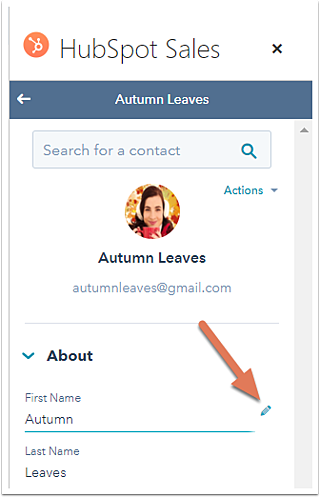 Once a recipient is added, the contact profiles pane will appear on the right-hand side. If the recipient is already a contact in HubSpot, their information will populate in the pane. If they're not a contact, click Add to CRM. The newly added contact's information will then populate in the pane. If you have contact profiles disabled, when you compose a new email, contact profiles will no longer appear by default. 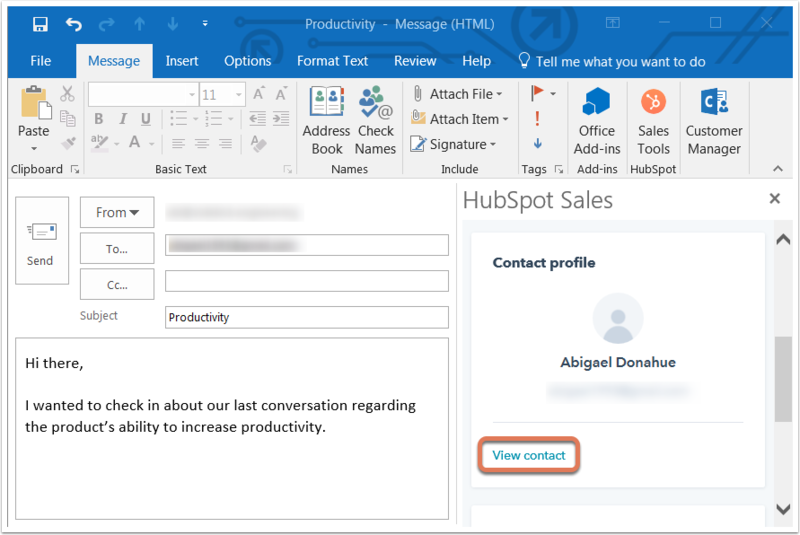 You can still view contact profiles for a specific email by clicking Contact Profiles in the HubSpot section of the Outlook ribbon. Please note: if GDPR is enabled in your account, the contact profiles will always be enabled in your Outlook inbox. 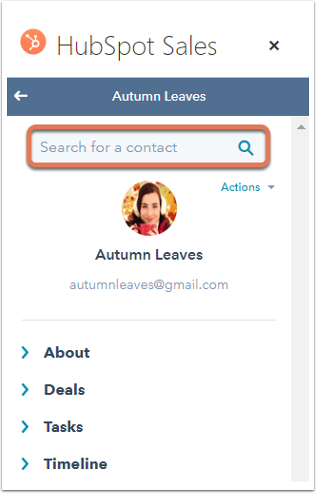 In the contact profiles pane, use the search bar to search for a specific contact in your HubSpot contact database by name or email address. Once you select the contact, you'll pull up more information from their HubSpot contact record in the pane. 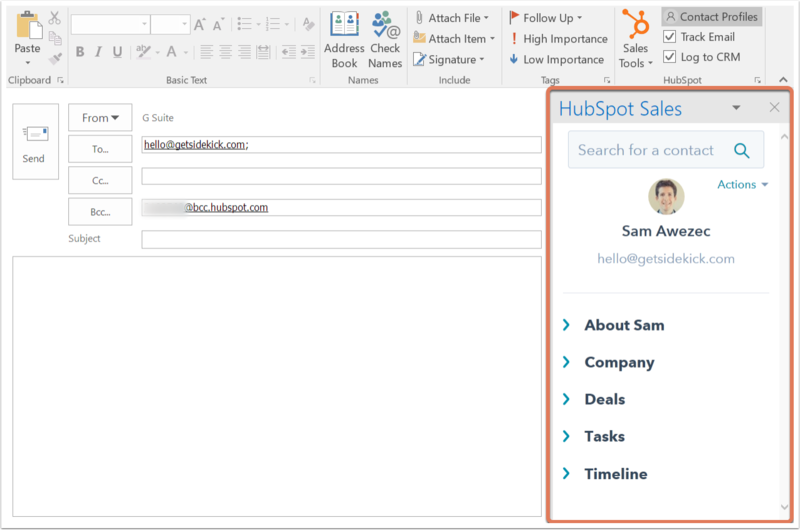 When you click a contact's name in the pane, you'll see more information on the contact pulled from your HubSpot account, including the contact's About section, deals, tasks, and timeline. 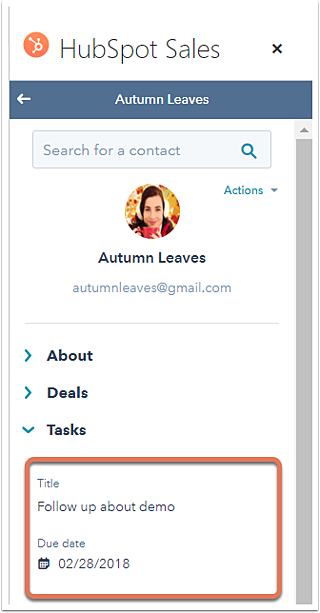 You can edit contact properties under the About section and create tasks under the Tasks section. 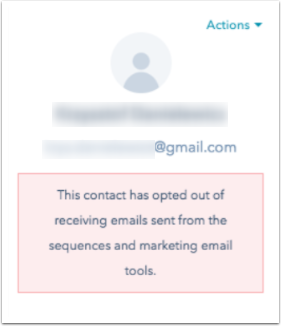 Additionally, if the contact has unsubscribed from your emails, you'll see a message in the pane below their email address. In the pane, click About to view the contact properties. The properties here are the ones specified as default in your HubSpot account. Hover over the contact property you want to edit and click the pencil icon. Enter a new value for the property and click Save. In the contact profiles pane, click Tasks. Here, you'll see the contact's existing tasks if they have any. Click Create task to create a new task for the contact. Two fields will appear. Enter the task name and select a due date for the task. The task will be saved in the contact profiles pane under the contact's Tasks section. It will also be saved in HubSpot under Tasks in your main navigation menu as well as on the contact's timeline. 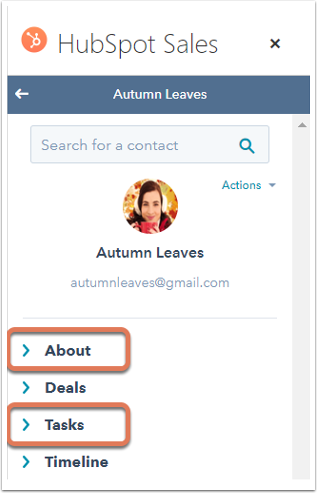 While you can search your database and edit contacts right from your inbox, you can also navigate to the contact record in HubSpot to see additional information. To do so, in the contact profiles pane, click the contact's name. Then click the Actions dropdown menu and select Open in CRM. You can also select Call. 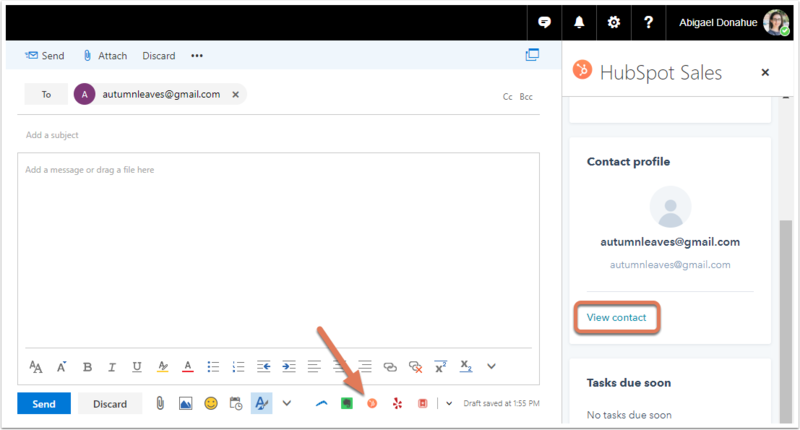 The contact's record in HubSpot will open in a new browser tab or window, and the Call tab above the timeline will be automatically selected.